13 weeks ago as I was carried off the Queen K with 9km to go I never imagined that my injury would be bad enough to keep me from running at Tauranga. But about 4 weeks ago when I was still unable to run I came to the realization that Tauranga was not going to be the race I had hoped it would be. I had entered as an elite and wanted to see how I would stack up against the other elite girls so instead of switching to a team I kept my individual entry and decided to just swim, bike then stop. The womans elite field was quite stacked with a few overseas girls including Rebekah Keat who had broken the world Ironman record at Roth (unfortunately Chrissie Wellington also broke it before her), compared with last year when there was really only two big names with the rest more at a second tier level. RooRoo wasn't quite as well prepped at he could have been with a dead TapTap (I kept in on in the hope it would come to life at the right time), and despite all my best efforts and about a thousand pieces of electrical tape, I just couldn't get the wheel cover to work without rubbing the chainstay. But I had my fast race tyres and some swanky new bar tape so I guess that was something. Race morning brought a nasty cold wind which was chopping up Pilot Bay big time. I was a bit worried about jumping on the bike in my wet gear and freezing to death, being cold wasn't something I was prepared for in this race because it is normally so hot. The water was actually quite warm but was very choppy and had some strong currents as well as an outgoing tide which didn't really help. We were already quite far in front of the wharf when the gun went and it didn't take long for me and a couple of other elites to get dropped by the main pack. 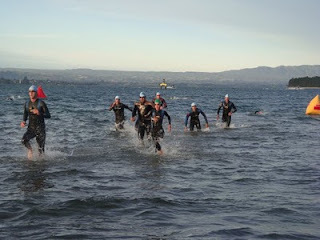 The swim course was a small loop (700m) then a big loop (1300m) with lots of boats to dodge and reasonably small buoys. The current was pretty strong and after only a couple of minutes I had lost my pack and gone way off-track, so not a good start. It was a struggle the whole way, with the peak being getting trapped under a buoy and having to be pulled out by an AG man which was really not a nice experience. So big thanks to the guy who pulled me out. One of my friends got swept under a boat so at least I wasn't the only one. The outgoing tide was moving quite quickly and we had to run through shin deep water for about 50m to the beach. Not surprisingly my time was terrible, I didn't even look at my watch but my offical time was 36.49 including transition so I guess 35ish. Pretty bad. Followed it up with a bad transition then jumped on my bike and tried to redeem myself. Bike went pretty well, I've never been far up in the field enough to have decent people to work with. It got a bit crowded at times and had the usual tools who would bust into the nice 7m gap I would have between me and the person in front so I would have to drop back which would upset the person behind me, and so on. Without TapTap to go on I just rode how I felt and it was pretty comfortable most of the way. Managed to pick up a couple of the other elite girls ahead of me and one of them stuck with me for the rest of the ride despite my best efforts to shake her. Total ride time was 2hrs29 which I was pretty happy with, my previous best at this race was 2hrs42 in 2008 so a good improvement there. Came off the bike in 10th place which I think I could have held on the run in my normal running form. 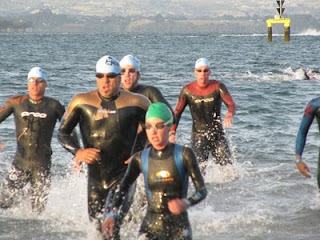 This was going to the last time I did Tauranga for a while but think I will have to come back next year to finish properly and hopefully I will be fitter and faster!! Big ups to the Bowden's for both having stellar performances and to Jared for edging out Davo in the run, and to Roger for toughing it out with not much training under his belt. There was a big Hot Cycles show down between Neilio and Paulio with a lot of smack talk happening in the last few weeks with Paulio coming out on top by beating Neilio by 4mins after Neilio rode so hard that he blew up after 65km. The Kona Lunapule crew were out in force with CK getting the fastest run split and AndyPandy smashing Mike by 30sec. And commiserations go to Bevvy who has been out for about the same length of time as me with a sacral stress fracture but he is still on crutches and pretty far from getting back into it.